Paraneoplastic syndrome basically is the indirect and remote effects of cancer, which are not directly related to the invasion of tumor cells in an organ. More often they are caused by the chemicals that release from cancers, It includes the symptoms such as: Deposition of some extra tissues under the fingernails, formation of a new bone under arms or along lower legs, anemia which is lowering in the number of red blood cells, high calcium and low sodium level in the blood, other effects include muscle weakness, degeneration of a brain, skin rashes, weight loss and fatigue. 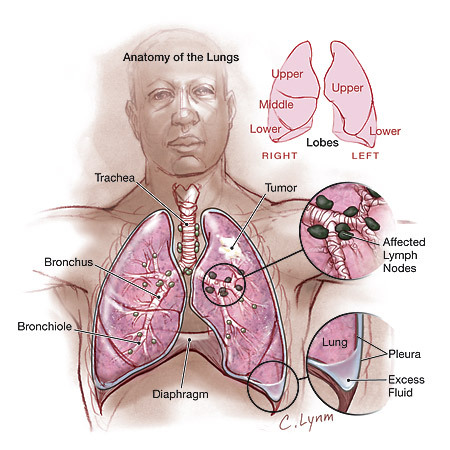 Cigarette smoking is basically the most important and threatening cause of a lung cancer. Research has established this relationship. Smoke of cigarette contains 4,000 chemicals or more than that which have been identified as a major cause of cancer. A smoker who smokes one pack or more a day is at the extreme risk of cancer development, which is 20-25 times more than a person who never smoked. Once a smoker quits smoking, the rate of cancer development in him is gradually decreased. After 15 years of quitting, this risk decreases to a level of a person who never used to smoke. Pipe and cigar smoking also increases the risk of a lung cancer, but it is not as much as cigarette smoking. Use of tobacco is the major cause of 90% of lung cancers. The lung cancer risk development is related to some factors, which are: number of cigarettes which is smoked, person’s age at which he started smoking, time for how long did he smoked or for how long he smoked before he quit smoking. Other causes of a lung cancer may include: Secondhand smoke or a passive smoking is a major secondary cause, Air pollution which may be due to vehicles or factories;experts have a believe that a long term exposure to such polluted air increases the risk of developing a lung cancer. Lung cancer risk increases 9 times by asbestos exposure, while a combination of asbestos and a cigarette smoking increases the lung cancer development risk by 50 times. How-do-you-do, just wanted you to know I have added your site to my Google bookmarks because of your extraordinary blog layout. But in earnest, I think your site has one of the freshest theme I’ve came across. It really helps make reading your blog a lot simpler.